An economically priced collection of leading worship songs from around the world including favourites such as 'Firm Foundation', 'All Things are Possible', 'This is the Day' and 'There is None Like You.' Great value with over an hour of great music for just $19.95! 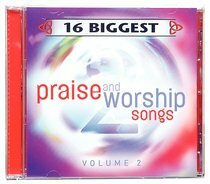 About "16 Biggest Praise and Worship Songs Volume 2"